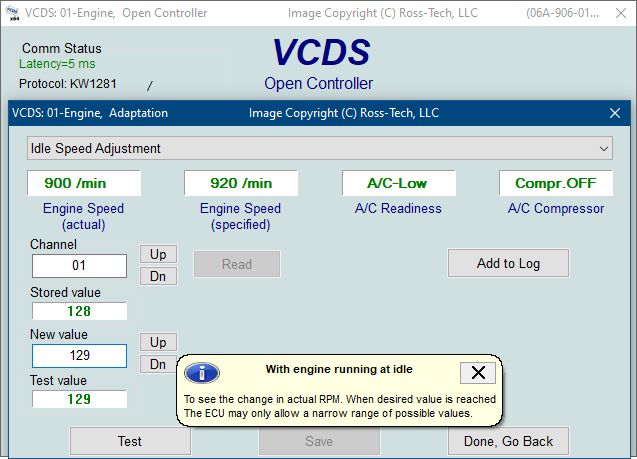 The Adaptation function allows you to alter certain values and/or settings in control modules which support it. You should refer to the Factory Repair Manual for your particular car (or some other documented procedure) before "playing" with the Adaptation function. However, many available Adaptation Channels are totally undocumented! You can use the [Up] and [Dn] buttons next to Channel to scroll through all 255 possible channels, or you can manually enter a channel number and click [Read]. If a channel exists, VCDS will show you the Stored Value. If a channel does not exist, the Stored Value will show as "N/A". Other data the controller may or may not send will be decoded and shown in the four display fields at the top of the screen. Once you have reached a channel of interest, you can use the [Up] and [Dn] buttons next to New Value to incrementally change and test the value. Or you can directly enter a New Value, which will then require you to click [Test]. This will tell the controller to temporarily use the new value so you can evaluate its effects. When you are satisfied with the effect of a New Value, you can store it in the Controller permanently by clicking [Save]. Soft reset can be checked to prompt the control module to "reboot" itself after the change has been made. In some cases this (or cycling the ignition) is needed in certain UDS modules before changes take effect. If you'd like to record just a snapshot in time of the current readings in each group, click on [Add to Log]. This will save the results to your PC, typically to your C:\Ross-Tech\VCDS\Logs directory. Channel 00 is a special case. 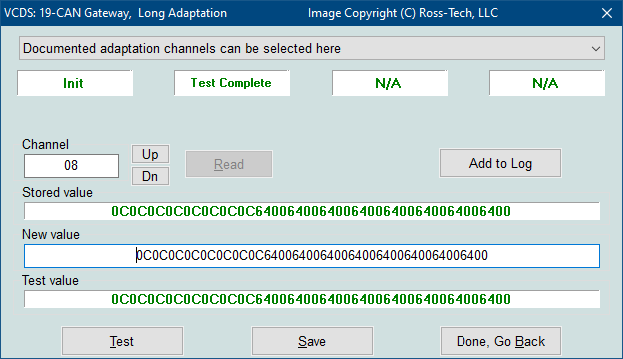 Performing a [Save] to Channel 00 resets all adaptation values to their original factory defaults. 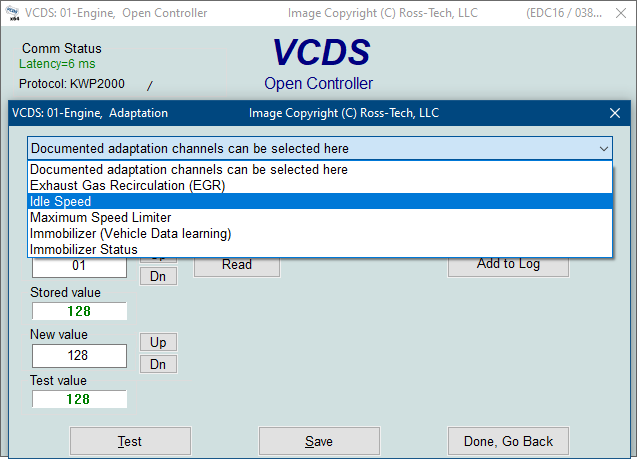 This only works in controllers that support this function, see your Factory Repair Manual to find out if this procedure applies to each controller in your vehicle. Some Engine and Immobilizer controllers will require a valid Login before permitting you to [Test] or [Save] Adaptation values. Values put in with [Test] but not Saved will persist until controller is powered-down. If an uninitialized control module warning appears, this means that one or more of the WorkShop Code, Importer, or Equipment numbers are all zeros. 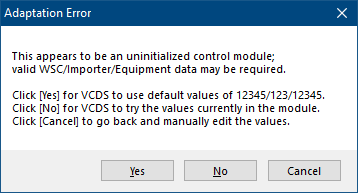 Since some modules will not allow you to Save Adaptation values unless non-zero numbers are in any or all of those fields, VCDS shows you this error when it thinks this might be the case.. In most cases you should click [Yes] to allow VCDS to enter 12345/123/12345 in those fields. If you click [No] then VCDS will try using the values currently stored in the module even if they are all zeros. If you click [Cancel] then VCDS will allow you to manually type in values for each of those fields. Click [Done, Go Back] to return to the Open Controller Function Screen.